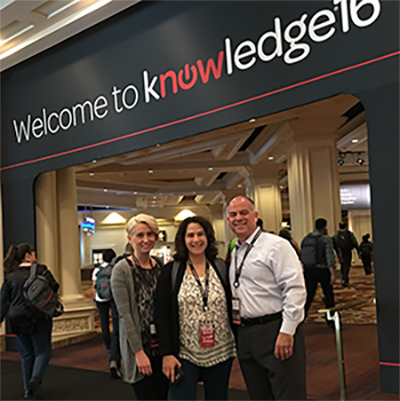 Amtechs software support sister company Futura Services was excited to attend Knowledge16, the 10th annual user conference for technology support market leader ServiceNow! This year’s conference in Las Vegas had more than 12,000 attendees and nearly 500 learning sessions including 173 hands on lab sessions. Amtech decided in 2015 to complete a total technology upgrade of their support infrastructure and portal. ServiceNow was selected as the tool of choice. The project and offering has been renamed iServe and will be available to Amtech Software customers by year end. 1)Knowledge: Attend sessions and continue to build our knowledge of the ServiceNow platform and its capabilities. 2) Confirm our Approach and Scope: Answer foundational questions about our implementation approach and scope. 3) Learn from Other Customers: Network with other ServiceNow users, gain insight and benefit from their experiences. 4) Understand ServiceNow’s Strategic Direction: Meet with ServiceNow executives regarding their strategic direction and latest product offerings that were in alignment with our use cases.